The round orange Pumpkin has many variations in the German cuisine, and one usage is to make a compote, or "Kompott" as we say in German. You practically can make compote with the most fruit. The Pumpkin Apple compote is a sweet dish and it is served in Germany often with German Griessbrei (Semolina Pudding), Rice Pudding, or Vanilla Pudding. Happy Cooking! - Cut the pumpkin meat in regular pieces or ace out little round balls with a spoon. 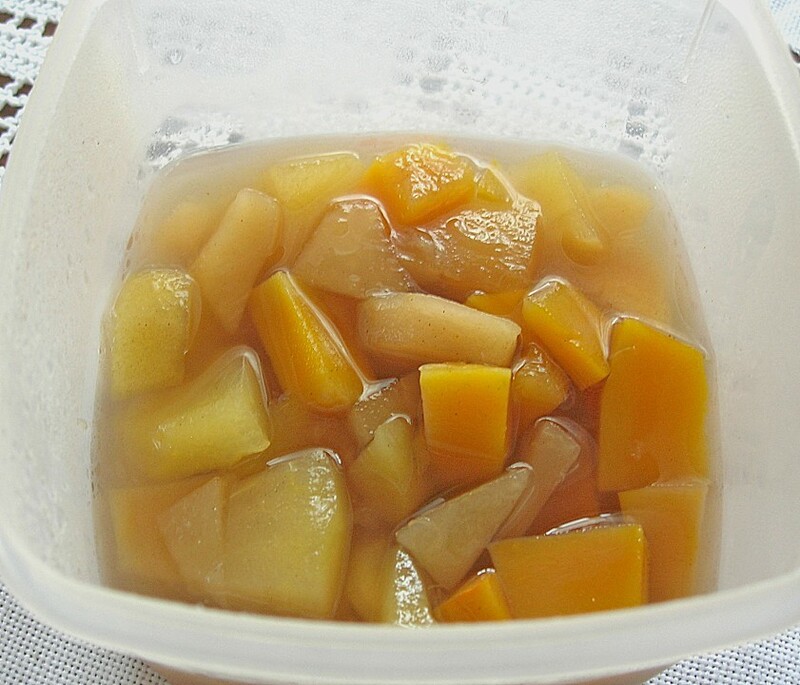 - Peel apples, remove core and cut in small pieces. Sprinkle with lemon juice. Set aside. - Bring the water with the vinegar, sugar, cloves, cinnamon stick and the lemon peel to a boil, add the pumpkin pieces. - Cook until the pumpkin pieces are semi soft (time depends on the kind of pumpkin you are using). - Add the apple pieces (less cooking time than pumpkin). - When fruit is soft enough remove from stove, let cool off. - Remove cinnamon stick and cloves; add more sugar if it is not sweet enough.